The findings of the research report by Transparency Market Research (TMR) reveal that the global market for automotive intake manifold is highly fragmented on account of the presence of a large number of companies. A considerably large number of market players are concentrating on research and development activities and product innovation to pump up their revenue and achieve recognition. For instance, in March 2017, Wuhu-based leading Chinese automobile and engine manufacturer Chery introduced its new engine, E4T15B, which has been counted among the most powerful engines in China. The engine features an integrated intercooler intake manifold technology that will not only enhance thermal efficiency but will prevent the issue of engine knocking. “The leading companies are adopting collaborations and partnerships as key business strategies, which will help them in the long run to expand their global operations,” says the lead author of the report. Some of the major companies operating in the global market for automotive intake manifold are Magneti Marelli S.p.A., MAHLE GmbH, Röchling Group, and Mann+Hummel Group. TMR’s research report states that the global market for automotive intake manifold was valued at US$42.7 bn during 2015. 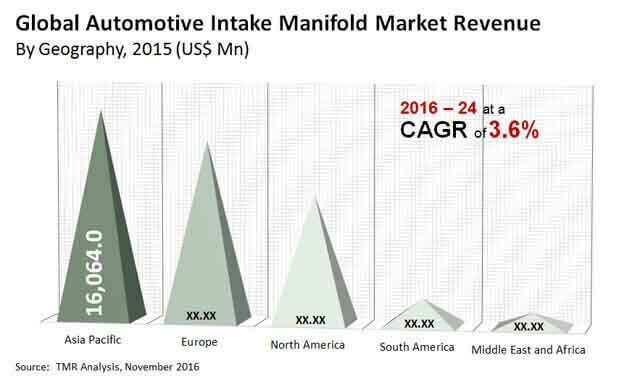 The global automotive intake manifold market is expected to reach US$58.7 bn by 2024, exhibiting a CAGR of 3.6% between 2016 and 2024. Asia Pacific accounted for the largest share in the global market for automotive intake manifold during 2015. Significant growth of the automotive sector backed by increasing investments by the leading automakers and emergence of technologically advanced automotive solutions are driving the automotive intake manifold market in Asia Pacific. As the demand for passenger vehicles such as multi-utility and sports-utility vehicles, hatchbacks, and sedans is rising in Asia Pacific, the regional market is likely to advance further. By material, aluminum is expected to retain the dominance in the overall market, expanding at a CAGR of 3.3% between 2016 and 2024. Due to its superior corrosion resistance properties and lightweight, the demand for aluminum is expected to rise at a moderate pace over the forecast period. Since a growing number of manufacturers are attempting to introduce advanced automobiles, the global demand for automotive intake manifold is expected to rise substantially. Modern automobile engines exhibit high efficiency and eco-friendly characteristics such as lesser emission and lesser fuel consumption. The implementation of stringent emission control regulations across several nations has also enabled the market to exhibit strong growth. For instance, the implementation of the Corporate Average Fuel Economy (CAFÉ) framework in the U.S., in order to limit the weight of vehicles, has played a pivotal role in boosting the market for automotive intake manifold. Consequently, a number of manufacturers are using lightweight components in automobiles. Aluminum, a light-weight metal, is one of the most widely used materials in the automotive intake manifold market. Superior quality plastic is also being adopted by numerous manufacturers in production process, ensuring fuel economy. All this has stoked the growth of the global market for automotive intake manifold. In spite of the continuous expansion of the market, the unpredictable prices of raw materials might limit the growth of the market to an extent. In addition, the rising cost of metals such as aluminum and steel can also affect the growth of the global market for automotive intake manifold. However, the market can witness further growth on account of the high number of research and development projects aimed at developing novel, cutting-edge automotive technologies.The information presented in this review is based on a Transparency Market Research report, titled, “Automotive Intake Manifold Market (Material - Aluminum, Plastic, and Composites; Vehicle - Passenger Cars, Light Commercial Vehicles, and Heavy Commercial Vehicles) - Global Industry Analysis, Size, Share, Growth, Trends, and Forecast 2016 - 2024”.